MU Online. It’s been more than a decade since I last heard that name. Back in my college days, it, aside from Ragnarok Online, was one of the MMORPGs to play. Taking inspiration from the medieval fantasy and hack-and-slash games made popular during the late ‘90s, MU Online was a fast, frantic, and sometimes disorganized mess of an online isometric rag that won over a lot of local gamers back in the day. Fast-forward to 2015 - Tianma Studio and WEBZEN brought MU Online to the mobile platform as MU Origin, which was mostly well-received. 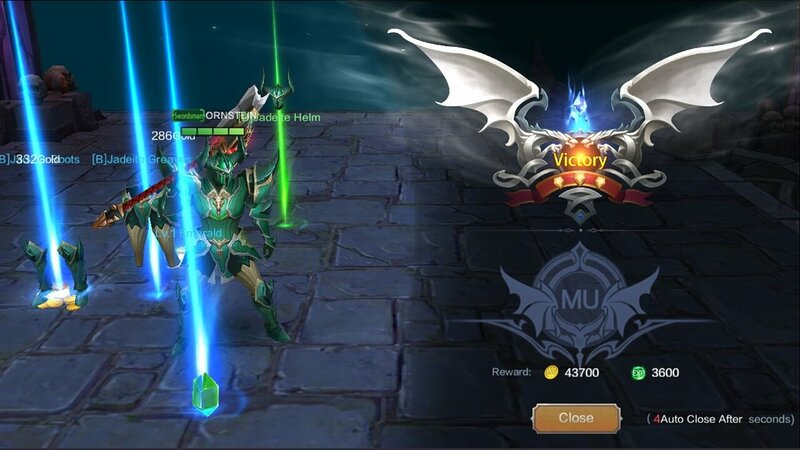 Its sequel, conveniently titled MU Origin 2, was just released in Southeast Asia this past month, further piquing my interest, since I had not played any MMORPGs on my phone in ages. I installed and began MU Origin 2 expecting it to be similar to its older brother. Boy, was I wrong. Not only did it got a visual upgrade and features that weren't found in the original game, but MU Origin 2 also had a feature I was not aware of that’s apparently become the norm in mobile MMORPGs. And with this in mind, I played two versions of MU Origin 2: one where I played the game normally, or dare I say “traditionally”, and one where I played the game the way its creators intended. First things first, you’ll be choosing a class for your player character. The classes present in MU Origin 2 are straight-up nostalgic: you have the Dark Knight, the Elf, and my personal choice during my time with the game, the Dark Wizard. I named him Baral if anyone was wondering. There aren't many customization options at all aside from setting up your character’s name, which isn't a surprise given that the original game dropped you right in after you picked your class. Once you're in like Flynn, you're greeted by a speaking NPC, which impressed me - MU Origin 2 actually provides most NPCs with a few voice lines. Said NPC gets you up to speed with the happenings in the world of Lorencia, since apparently, you’re a returning adventurer who left the realm a long time ago and now has come back! It's as if the game knows I haven't played a MU Online game in years. After a few walls of lore and dialogue and the requisite tutorials, MU Origin 2 introduces you to what might be its best (and probably worst) feature, a criticism probably applicable to most mobile MMORPGs of the same mold: an autopilot button. By the time the NPC told me about the autopilot button, I was somewhat flabbergasted. Appalled even. Why would anyone in their right mind play a game and NOT play a game by letting it play by itself? I was taken aback by what the devs were thinking, having a button that basically lets your character automatically fight, use skills during combat, pick up loot, equip new and better gear you just looted, assign stat points, and lastly, travel to quest objectives and/or areas where you can farm monsters. One button to rule them all. The game’s so streamlined, you’ll only need to put down your sandwich and return to your phone if dialogue starts, since that’s the only thing MU Origin 2 didn’t automate. MU Origin 2 cares about their lore, people. At first, I didn’t like this feature in my mobile online game. At all. But after pondering this issue carefully (and taking a few good points during an argument with a friend), I found that it made perfect sense to have this in a mobile MMORPG, provided that the devs could do it right. Mobile games are mostly played during commutes, during office and school breaks, and, whether people admit to it or not, during office and school hours as well. It also doesn’t help that playing on the phone with a virtual joystick and buttons via the touchscreen is inefficient for most people. Having some form of automation is a godsend. Once I got comfortable with the game’s controls and flow (or lack thereof), I was hacking away monsters and finishing quests with ease while leveling up my character at blazing speeds. At the time of its release window in Southeast Asia, MU Origin 2 is somewhat generous when it comes to EXP and gold. One time I was commuting for an hour, I got myself from level 20 to 90. Not only does finishing quests and fighting monsters give you experience for your character, but the game also gives you rewards from various actions and achievements. Just logged in for the day? Have a bajillion gold and exp. Already reached lvl 150? Have a decent armor set along with more generous servings of gold and exp. Character progression in MU is pure bliss thanks to how fast things are going and how the game introduces new mechanics and features (like gem crafting, wings, transmutation, the EXP dungeon, PVP) the further you level up. After a week of quality time with my Dark Wizard, I decided that it was time to play MU Origin 2 the way it was meant to be played (at least in my mind). So I created a new character from scratch and played the game without using the autopilot button. My experience without it was vastly different. Only an hour into the game with my fresh new character, I was already having a bit of a slow time looking for the objectives/monsters needed to complete my quest. Once I received a new quest, I had to open up my map to find the quest giver. Once I finally conversed with “Mr. Gaskell”, my quest tab let me know what to do (in this case, kill ten... uhh... skeletons?). Fortunately, MU Origin 2 is designed in such a way that most of the quest objectives assigned to you are nearby the quest giver. The hard part is knowing where to look on your map, since naturally, you’re looking at a tiny mobile phone screen and the game’s camera is locked in an isometric view, so you really do have to rely on the game’s map. The autopilot button’s quest pathing is such an efficient tool that even purists would be nuts not to use it. However, there are still things I’ve certainly appreciated when playing MU Origin 2 without the autopilot on, the biggest one being the game’s combat and mechanics. Running around each area and dungeon while you hack and slash mobs of monsters is so satisfying once you’re in full control. Combat in MU Origin 2 has an auto lock-on feature that targets the nearest enemy. And most if not all of each class’ normal attacks have a generously huge hitbox, so you really don’t have to worry about your normal attacks missing when trying to hit mobs. By the time my second week of playing MU Origin 2 hit, I reached a verdict on what ‘version’ of MU Origin 2 I enjoyed the most. Surprisingly, I enjoyed playing it with the autopilot button more than I did without the autopilot. I was hitting my levels and gaining EXP faster, and was able to even farm for a few minutes while working on something else. Heck, even as I’m writing this article, my lvl 200 Dark Wizard is doing work and finishing up daily quests. It’s just too convenient! This is such an efficient way of playing not only MU Origin 2, but all mobile MMORPGs. However, that doesn’t mean that I rely too much on the autopilot. Every now and then, there are PVP modes, as well as other random times where I’d turn it off to enjoy MU Origin 2’s combat. At the end of the day, what’s important is how much fun you’ll be having, and how you’re gonna do it. In my case, I think I’ll be spending a bit more time levelling up my Dark Knight and see where the endgame takes me (his name is Ornstein if anyone was wondering). Until next time, happy leveling, and don’t fall asleep at the wheel!